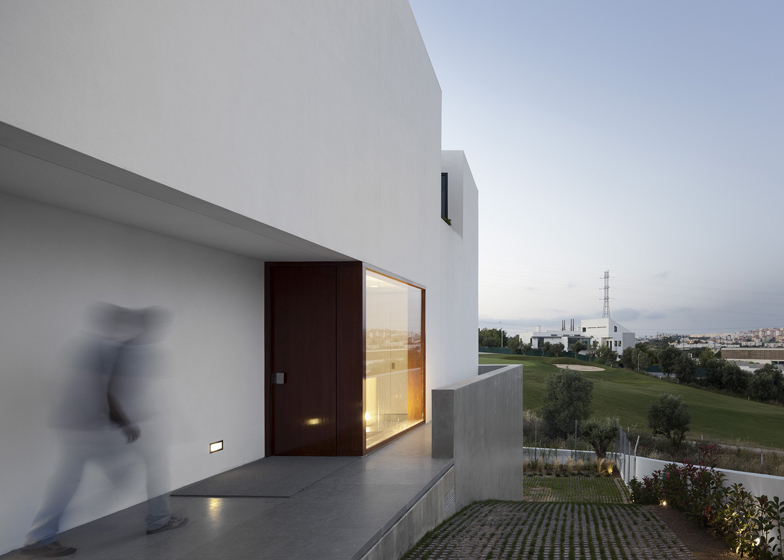 This house outside Lisbon by architects GGLL Atelier has a grey base that nestles into the landscape and an angular white upper level that follows the incline of the hill (+ slideshow). 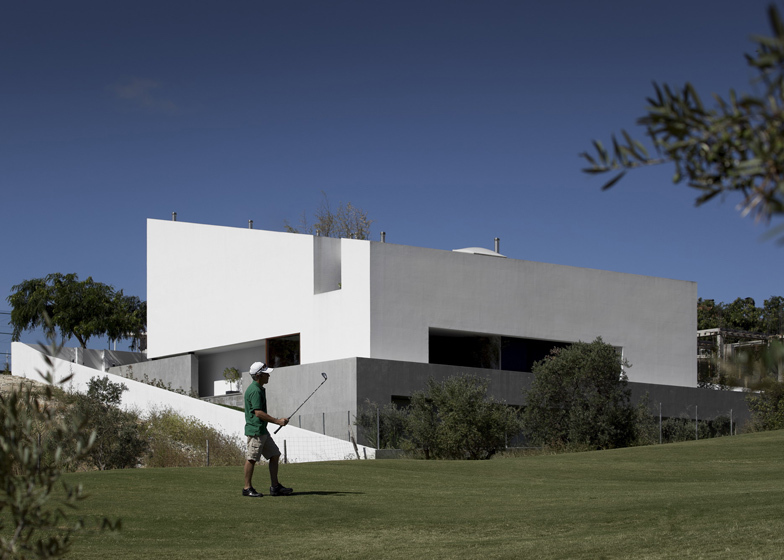 GGLL Atelier designed the residence as the home for a family of four and it is located beside a golf course. The house features an L-shaped plan that folds around a patio on the south side of the house. "The L-shaped plan came from the need to create an exterior area that is protected from the wind from the north," architect Gary Barber told Dezeen. A garage, a wine cellar, a games room and a cinema room are located on the ground floor, while living rooms, bedrooms and a library benefit from the higher ceilings on the first floor. "We split the house into two distinct volumes," said Barber. "The base is where the least common areas of the house are found and it has a more solid nature, kind of working like a pedestal. 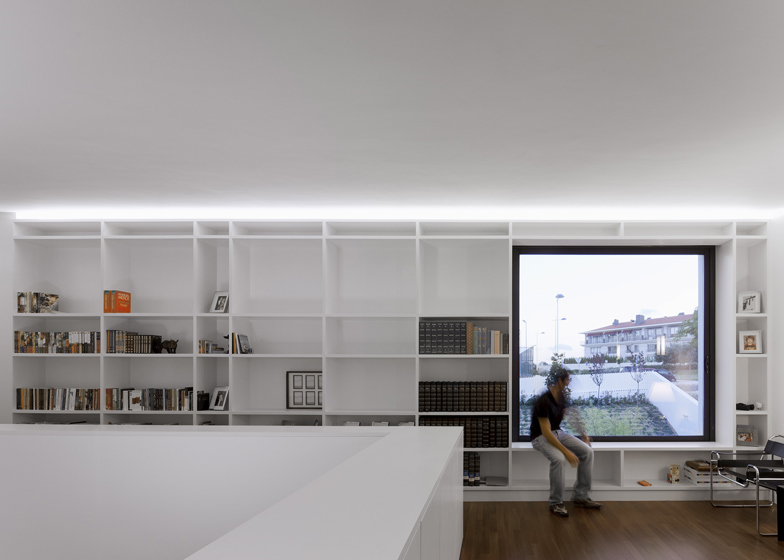 The upper volume of the house is where the more normal spaces are found and is white to show the clean lines." A terrace occupies the roof, offering a view out over the golf course. The House is inserted on an estate situated at the northern limit of Lisbon, the lot is north-facing with an accentuated decline. 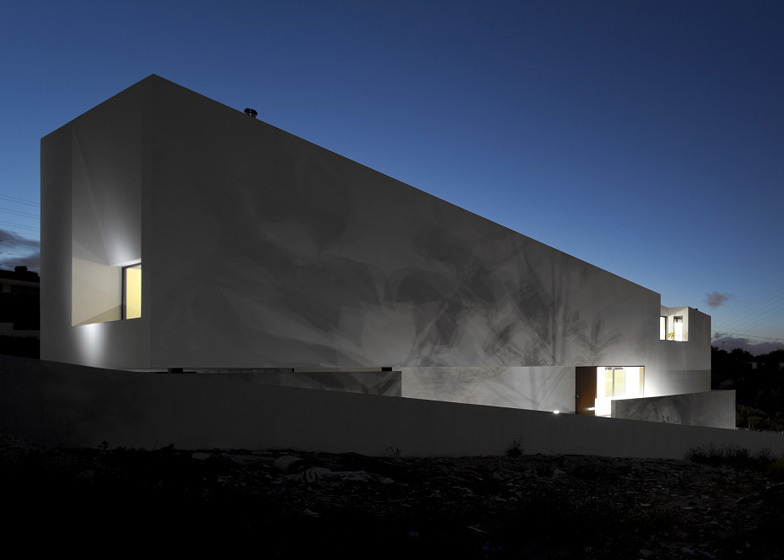 A grey volume draws the exterior spaces of the house and rectifies the inclined nature of the terrain, allowing the social areas a better solar exposure, the slanting white volume floats over it, turned away from the exterior limits of the lot and opening over the garden and the swimming pool. The distribution is pragmatic and very clear: The grey volume is filled with the complementary spaces of the house, illuminated by a patio carved in it (shower room, spa, cinema room, wine cellar and garage) the white volume is occupied by the main spaces of the house (lounge, library, kitchen and bedrooms) privileged by the transparency towards the garden and swimming pool. The rooftop is torn by a white terrace overlooking the golf-course and the city skyline.